Digital preservation requires a strategy for the storage of large quantities of data, which increases dramatically when dealing with high resolution images. Typically, decision-makers must choose whether to keep terabytes of images in their original TIFF format or compress them. This can be a very difficult decision: to lose visual information though compression could be a waste of the money expended in the creation of the digital assets; however, by choosing to compress, the costs of storage will be reduced. Wavelet compression of JPEG 2000 produces a high quality image: it is an acceptable alternative to TIFF and a good strategy for the storage of large image assets. Moreover, JPEG 2000 may be considered a format that can guarantee an efficient robustness to bit errors and offers a valid quality with transmission or physical errors: this point of view is confirmed by the case study results that we report in this article, concerning image quality after occurrence of random errors by a comparison among different file formats. Easy tools and freeware software can be used to improve format robustness by duplicating file headers inside or outside the image file format, enhancing the role of JPEG 2000 as a new archival format for high quality images. In recent years the JPEG 2000 format has been widely used in digital libraries, not only as a "better" JPEG to deliver medium-quality images, but also as new "master" file for high quality images, replacing TIFF1 images. One of the arguments used for this policy was the "lossless mode" feature of JPEG 2000; but this type of compression saves only about the half of the storage requirements of TIFF, so it is unlikely that this was the only reason that digital libraries moved in this direction. The only reasonable choice was the standard lossy compression, which offers a 1:20 (color) or 1:10 (grayscale) ratio. This provides a significant savings in terms of storage, considering that the quality of images in digitization projects has increased dramatically in the past few years: the highest standards for image capture are now very common in digital libraries. As mentioned above, some institutions began to store JPEG 2000 files in their digital repositories as the "archival format"4. This policy was sometimes officially declared, or in some cases was adopted de facto. "It is not an archival format ... Existing web browsers (mid-2007) are not yet JPEG 2000 capable. One of the biggest problems with the format is the need for viewing software to be added to existing web browsers ... There are very few implementations of the JPEG 2000 technology, more work needs to be done before general understanding and acceptance will be possible." However, this is no longer the case: most common commercial, digital imaging programs now support JPEG 2000, not to mention JPEG 2000 support by some excellent shareware.11 The real problem is that the JPEG 2000 format allows the storage of very large images, and no current programs can manage the computer memory in an intelligent way: this is the commercial reason for professional image servers and encoders, which are relatively costly,12 or specific viewers for geographic images (generally free13), or browser plug-ins (free as well). The primary objection to JPEG 2000 compression remains the possible loss of visual information. Our approach in arguing against this will not focus on how the wavelet approach works,14 but why it works, with some very basic elements of compression theory.15 In other words, preserving visual information deals mainly with how the images are perceived visually, and only secondarily deals with the mathematical aspects of the physical signal (materials, procedures, techniques). Some would argue that images look the same as they did before compression simply because humans don't see very well, and that a deeper examination (or a better monitor) would reveal errors and losses. This is not true: even when JPEG 2000 images are enhanced by magnification, no human could perceive any errors or losses. A digital surrogate is not necessarily a bad copy of the original, and compression does not always mean loss of information. Some people also may think that compression is the equivalent of the "sampling" of a signal; for example, if we choose 300 points per inch to represent an object, sub-sampling might take only 150 or 100 points instead, which creates the risk of losing some information essential for reconstructing that signal. Any sampling below the Nyquist rate produces aliasing effects: if we represent the signal as a wave, the sampling interval should match exactly the shape of the wave. Otherwise, original images are "misunderstood" and appear as artifacts. But compression is not a kind of sub-sampling made after the capture of an image. We can either eliminate redundant information (a sequence of identical values), or we can have some kind of lossless compression, but below the physical-mathematical reality, we can operate on the human perception of it. Since we are dealing with the information that we perceive with our eyes, we can compress irrelevant information, i.e., what is less relevant to our senses. The human eye is less sensitive to colors than to light, so the chrominance signal can be compressed more than the luminance signal can, without any loss of perception. This is very important with digital images of historical documents, as they are usually either color or grayscale images, i.e., "continuous tone" images. As opposed to a "discrete tone" image (as a printed or typed document in black and white), in a continuous tone image any variation of adjacent pixels is relevant: in other words, pixels are "correlated" with each other. We cannot retrieve a sequence of identical values to compress, and we need a more sophisticated strategy. Figure 1: An 8-bit grayscale image and its bit planes. The image is at 8-bit depth, so we have 1+8 bits (the first represents +/- sign). At positions 2,3,4,5 (i.e. at bit-plane 2,3,4,5) we find only "0", and at position 8 find only "1": this is also expressed by saying that the relevance of the information or energy (low frequencies) concentrates at certain levels, and the other levels (high frequencies) can be easily compressed.18 This is very clear in the following representation of an image in 8-bit planes: continuous tone variations between adjacent pixels are now turned in eight separate contexts, where it is now possible to compress adjacent values. 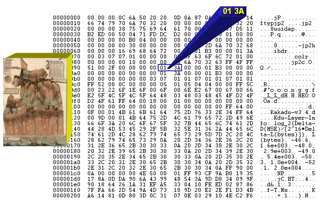 Figure 2: A corrupted JPEG file. There are two main methods for de-correlating pixels: orthogonal transform and subband transform. The concept of "transform" is easy to understand from a geometrical point of view: a transform, as a reflection, "is a mathematical concept, but it is not a shape, a number, or a formula"; it is more "a way to move things in space"19 to operate the Hi/Lo frequency separation mentioned above. The DCT (discrete cosine transform) is the typical orthogonal transform that has been used in JPEG compression for many years. In the JPEG compression, color images are decomposed in an YCbCr color space (Y is the luma, or the brightness in an image, Cb and Cr are blue and red chroma components, respectively): the luminance component is the most relevant to human eyesight, so it is less compressed than the other two components. JPEG can use DCT to break up an image to its spatial frequency components, and it compresses the low-frequency component first. This important  but optional  feature is called progressive encoding. Unfortunately, JPEG is generally used in a sequential mode, rather than in a progressive mode, so when data is corrupted, the encoding/decoding process fails and the rest of the image is lost. The subband transform implies that we consider a signal in the frequency domain, applying different algorithms than the Fourier DCT, currently known as "wavelets",20 as these mathematical functions are graphically represented as small waves moving up and down the x axis. The wavelet transform is bi-dimensional: it splits the array of values in the upper/lower and then the right/left elements, calculating the average and concentrating low frequencies in the top-left side of the array. This process of subband decomposition is repeated again and again in a progressive mode. In the reverse decoding, we can see a blurred image that becomes increasingly sharp, because each subband level adds new details to the basic graphic information stored at the top-left of the image array. Figure 3: Progressive subband decomposition. We can store color information at 48-bit color depth; this is important because this can be done with the TIFF format while it could not be done with the previous version of JPEG. Therefore, we will not loose color depth if we compress the image in JPEG 2000, and 48-bit or 16-bit depth is relevant, especially in digitized photographs. We can manage large images and very large images. Multi-resolution formats, in fact, were developed to manage satellite mosaic images and for large geographic maps. We can also specify a ROI (region of interest26) for implementing very high resolution in some parts of the image and leave the rest at a lower resolution. Finally, we can manage Intellectual Property Rights (IPR) effectively, because for high quality (or "master") images, we can prevent the download of the whole image. The user will see only the portion of the image that he or she requires, and we can eventually watermark on-the-fly the visualization window. How does JPEG 2000 work in practice? Colors are separated in three components: YCbCr. (This was possible in the previous JPEG format too, but it was only an option as progressive coding/decoding.) The image in each component is usually divided into more parts (tiles), and subdivided again in a grid (precincts) and small portions (code-blocks) that are scanned with the algorithm. All the data are then packed in a tagged file structure that we can imagine as a "matrioska" system of boxes. At the beginning of the main box is the "header box", inside the box we find other boxes for each tile with a "tile header" at the beginning, and inside these boxes there are markers and packet streams containing image data. As was recently shown by Judith Rog, the old concept of compression techniques as an obstacle to the digital preservation of images seem to vanish considering deeper file formats structure . In the error control features offered by JPEG 2000, two types of errors are considered: bit errors and packet losses (during transmission). The use of error control mechanisms depends on the coder and decoder implementation. The impact of bit errors mainly affects the error location, while packet losses have a dramatic effect on the image because an error involving packets implies a synchronization loss between coder and decoder. Bit errors hence affect only the concerned code-block; for this reason code-blocks are coded independently. 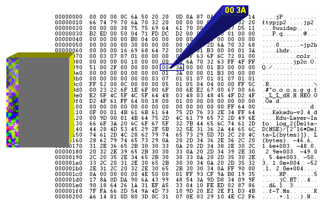 In the case of packet losses, JPEG 2000 offers the opportunity to use two kinds of termination strategies of the arithmetic coder on bit-plane level, enabling the detection of bit errors and the deletion of corrupted data. In addition, using smaller precincts increases the robustness against bit errors, although the coding efficiency is decreased. In particular, maintaining synchronization plays an important role in JPEG 2000. Therefore, Start Of Packet (SOP) marker segments can be inserted into the data stream prior to each packet. Using small precincts also increases error robustness in the packet loss scenario, because the amount of lost data is reduced. Figure 4: Kodak images test set. We investigated the impact of random errors on the JPEG 2000 bit stream by conducting some experiments. 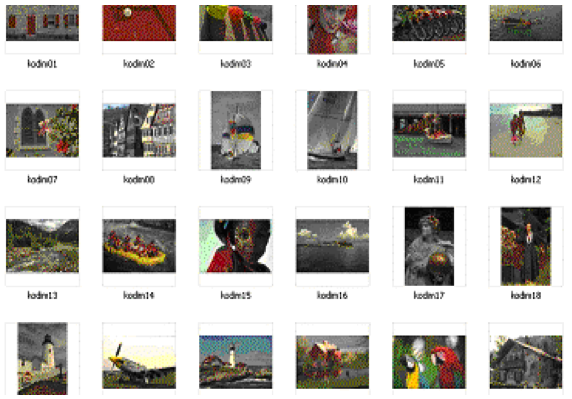 The image set we chose, proposed by Kodak, offers all possible chromatic and color-depth cases: the 24 images (Figure 4) are bitmap. They have 24-bit color depth and a dimension of 768 x 512 (1.153 KB for each one). 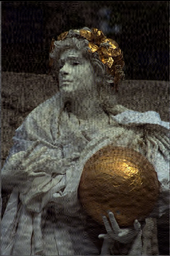 Original bitmap files were converted in TIFF (uncompressed) and then in JPEG and JPEG 2000 files. On every test image, we applied different compression ratios, which were selected considering preliminary studies. The following ratios were chosen: lossless, 1:5, 1:10, 1:15, 1:20, 1:25, and 1:30. We excluded major values because, usually, both JPEG and JPEG 2000 are used with 1:10 for grayscale images and 1:20 for true color images. We introduced errors writing a byte <0> if the pixel we changed had a value greater than or equal to <127>, and a byte of <255> if the pixel value was less than <127>. The error number was related to image dimension: 0.01% (around 10 byte); 0.1% (around 100 byte) and 1% (around 1000 byte). We didn't exceed the 1% errors because we found that after 1%, the errors percentage of any image format collapses. As shown in Figure 5a, an error rate of about 0.01% doesn't imply serious effects: the reconstructed image is very similar to the original. 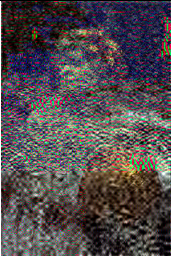 In Figure 5b, "noise" can be seen on a huge part of the image, but the subject of the image and its main characteristic are preserved. Figure 5c shows a bad result: in this case, we lost around 1Kb of information in different parts of the file (crucial tile, markers, etc.). Figure 6a is a JPEG format: The image is irremediably corrupted with only 0.01% of errors: a simple error can affect the entire bitstream and prevent correct decoding. With increasing errors, the file image cannot be opened. In Figure 6b, we see some of the consequences of errors on a TIFF format. At 0.1% of errors the image has some lines corrupted. The TIFF format has an end-line dedicated byte; therefore, removing or corrupting this value can damage a strip. In other cases, it is not possible to open the files if 0.1% errors are introduced (7 have failed: 30% tested image, see Table 1) and 1% errors occur (24 have failed: 100% tested image) . 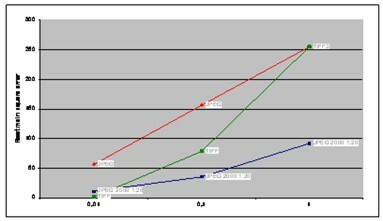 As shown in Table 2 and Fig.7, JPEG 2000 offers good performance in most situations. TIFF offers stability and quality only if error numbers are less than 0.1% with respect to image dimension. The previous JPEG format appears to be the worst format for preservation: in every case (high or low error rate), noise and error propagation is present on images. JPEG 2000, however, uses markers, headers and dedicated coding to prevent coding errors or transmission errors. It offers good performance at any error rate and with several compression ratios. It is significant to note that JPEG 2000 lossless files are not more robust than lossy ones. In particular, we tested compression at the ratio of 1:10, typically used for grayscale images, and 1:20, used for color image; the compression ratio 1:30 is only tested to show a possible trend in quality loss, because with JPEG 2000, there is no purpose for adopting any compression ratio more than 1:20. Otherwise, just as with TIFF and JPEG, JPEG 2000 has problems whenever errors exceed 1% (around 1Kb): some images cannot be opened, or a significant part of the information is no longer visible. Figure 7: Experimental results: JPEG, TIFF and JPEG 2000 1:20. JPEG 2000 file structure is not only robust itself, but moreover it is possible to add some additional robustness enhancements to the file structure. In all formats, the header image is a crucial element: the header supplies the basic information enabling the image to be visualized. It is a sequence of binary values, usually at the beginning of a file, where width, height, color information, and other information is held. The image may appear corrupted or not accessible even if only some bytes in the header are lost. For example, if we manipulate an original JPEG 2000 image header (see example in Figure 8a and 8b) introducing some error (only 4 bits), we cannot open the image, although the rows are integral in the remaining part. If we could duplicate this header and keep it inside or outside the image file format, we would dramatically improve its robustness. FixIt! JPEG 2000 is a freeware and shareware utility implemented by the Laboratorio Digitale of the Centro di Fotoriproduzione, Legatoria e Restauro of the Italian State Archives, and can be downloaded from our website.32 It can extract the JPEG 2000 header; test and eventually fix corrupted image files; analyze a file's information and main markers, and save it in XML format. It can be also used in a recursive mode for a large number of files in a directory tree (see Figure 9a and 9b). 0000070519:000006287816&reqid=24150#interview>. For general trends in digital imaging, see Steven Puglia  Erin Rhodes, Digital Imaging  How Far Have We Come and What Still Needs to be Done?, in RLG DigiNews Volume 11, Number 1, April 15, 2007. 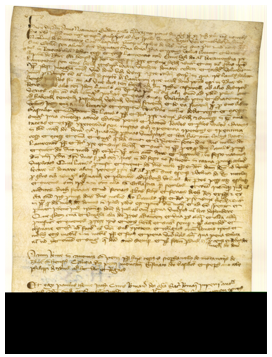 See <http://digitalarchive.oclc.org/da/ViewObject.jsp?objid=0000068890&reqid=26384>. 2. Tim Vitale. Digital Image File Formats  TIFF, JPEG, JPEG 2000, RAW, and DNG. July 2007, Version 20. Available at <http://aic.stanford.edu/sg/emg/library/pdf/vitale/2007-07-vitale-digital_image_file_formats.pdf>. Vitale does not appear to be an enthusiast of JPEG 2000 "JPEG and JPEG 2000 encode the original RGB image data (to the video standard YCbCr), altering the original numerical digital data permanently.... (p. 2), and further: "called Lossless, but uses YCbCr color space (50-67% color space compression); a roundtrip image will appear uncompressed, but RGB numbers are not original due to rounding and wavelet decompression errors" (p. 32). 3. Robert Buckley, JPEG 2000  a Practical Digital Preservation Standard? Technology Watch Report, Digital Preservation Coalition February 2008. Available at <http://www.dpconline.org/docs/reports/dpctw08-01.pdf>. 4. Betsy Kruger, Library of the University of Illinois at Urbana-Champaign, D-Lib Magazine, January/February 2008, Volume 14 Number 1/2: <doi:10.1045/january2008-featured.collection>. 5. Ronald Jantz, Michael J. Giarlo, Digital Preservation. Architecture and Technology for Trusted Digital Repositories, D-Lib Magazine, June 2005, Volume 11 Number 6, <doi:10.1045/june2005-jantz>. 6. Stephen Abrams, Stephen Chapman et al., Harvard's Perspective on the Archive Ingest and Handling Test, D-Lib Magazine, December 2005, Volume 11 Number 12, <doi:10.1045/december2005-abrams>. See also Justin Littman, A Technical Approach and Distributed Model for Validation of Digital Objects, D-Lib Magazine, May 2006, Volume 12 Number 5, <doi:10.1045/may2006-littman>. 7. Robert Buckley, William Stumbo, and Jim Reid, Xerox Research Center Webster (USA), The Use of JPEG 2000 in the Information Packages of the OAIS Reference Model, in Archiving 2007. Final proceedings of conference held May 21-24, 2007, Arlington, Va. Springfield, Va.: The Society for Imaging Science and Technology. 8. "The promising  but not yet generally accepted  JPEG 2000" says Edwin Klijn, The Current State-of-art in Newspaper Digitization. A Market Perspective, D-Lib Magazine, January/February 2008, Volume 14 Number 1/2: <doi:10.1045/january2008-klijn>. 9. Oya Y. Rieger, Preservation in the Age of Large-Scale Digitization. A White Paper, February, 2008 (CLIR pub 141), p. 20, http://www.clir.org/pubs/abstract/pub141abst.html; Rieger mention after "new archival file formats, such as JPEG 2000 and PDF/A" (p. 33). 10. See again Tim Vitale. Digital Image File Formats, p. 37. 11. Both Photoshop and AcdSEE can manage JPEG 2000 files; Irfanview is free, and can convert any file format, also if they have very large dimension: <http://www.irfanview.com>. 12. See, for example, Lizardtech, <http://www.lizardtech.com>, Luratech <http://www.luratech.com>, and ErMapper <http://www.ermapper.com>. 13. See, for example, Mapping Sciance GeoJP2 Viewer, <http://www.lizardtech.com/download/dl_options.php?page=third>, or Lurawave, &tl;http://www.luratech.com/download/jp2>. ISO/IEC, Information Technology-JPEG 2000 Image Coding System, Final Committee Draft Version 1.0, ISO/IEC JTC l/SC 29/WG 1 N1646R, March 2000. ISO/IEC 15444-1, The JPEG 2000 Image coding system-Part 1: core coding system, - ISO/IEC/ITU-T, 2000. 15. D. Salomon, Data compression. The complete reference, New York-Berlin, Springer, 2004 (3rd ed. ); online exercise and extra <http://www.davidsalomon.name/DC3advertis/DComp3Ad.html>. 17. Ivi, pp. 262-270; the image in Figure 1 is from <http://commons.wikimedia.org/wiki/Image:Lichtenstein_bitplanes.png>. 19. The expression is from Jan Stewart, Nature's Numbers, mentioned in D. Salomon, Data compression, ed. 1998, p. 249. 20. I. Daubechies, The Wavelet Transform, Time-Frequency Localization and Signal Analysis, IEEE Trans. on Inform. Theory, Volume 36, No. 5, pp. 961-1005, September 1990. 21. S. Mallat, A Theory for Multiresolution Signal Decomposition: The Wavelet Representation, IEEE Trans. on Pattern Analysis and Machine Intelligence, Volume 11, No. 7, pp. 674-693, July 1989. 22. Some free tools allow previewing JPEG 2000 files on operative system viewers: see <http://www.optimidata.com/english/Jpeg 2000sw/jp2_shell_extension.html>. 23. Daniel Lee, who worked in the ISO's JPEG group, points out, "JPEG 2000 offers a very comprehensive set of features in a single format and obviates the need to maintain two sets of files for each image. I definitely recommend that cultural heritage institutions use JPEG 2000 as a single preservation and delivery format" instead of keeping master files in a TIFF format and supporting an expensive storage system. See Editor's Interview: JPEG 2000. Dr. Daniel Lee, ISO SC29/WG1 (JPEG), in RLG DigiNews, Volume 6, Number 6,. December 2002. See <http://digitalarchive.oclc.org/da/ViewObjectMain.jsp?fileid=0000070519:000006287816&reqid=152144#interview>. 24. See (in Italian only) F. Lotti, La qualità delle immagini nei progetti di digitalizzazione, in "Digitalia", Dicembre 2006, pp. 22-37, <http://digitalia.sbn.it/upload/documenti/digitalia20062_LOTTI.pdf>. 25. D. Taylor-Pearce, Graphic file formats test page: JPEG-2000, November 2005: <http://www.she-philosopher.com/home/technical/graphicsformats.html>. 26. D. Nister and C. Christopoulos, "Lossless Region of Interest with Embedded Wavelet Image Coding," Signal Processing, Volume 78, Number. 1, pp. 1-17, 1999. 27. The idea was proposed by Manfred Thaller to the Delos Summer School on Digital Preservation in San Miniato, in June 2006.
projecten_en_jaarverslagen/digitalisering_ontrafeld_web.pdf>. See also the more recent report R. Gillesse, J. Rog, A. Verheusen, Alternative file formats for storing master images of digitization projects, National Library of the Netherlands, March 2008, <http://www.kb.nl/hrd/dd/dd_links_en_publicaties/links_en_publicaties_intro-en.html>, and, from the same authors, the paper Life beyond uncompressed TIFF: alternative file formats for the storage of master image files, in Archiving 2008. Final proceedings of conference held June 24-27, 2008, Bern, Switzerland: The Society for Imaging Science and Technology, pp. 41-46. 29. P. Amon, Error resilience for JPEG 2000, in Proc. Picture Coding Symposium, France, April 2003, pp. 243-246. 30. Very recently, tests on image file robustness has been made by Volker Heydegger at Cologne University, introducing errors in the file without excluding the header. Results are, of course, quite different, and more simple and uncompressed files result to be more robust: "complex file formats tend to get into trouble with keeping their data against bit errors" (V. Heydegger, Analyzing the impact of file formats on data integrity, p. 55, in Archiving 2008. Final proceedings of conference held June 24-27, 2008, Bern, Switzerland: The Society for Imaging Science and Technology, pp. 50-55). We will assume that file complexity is not a problem  if you can manage it  i.e. 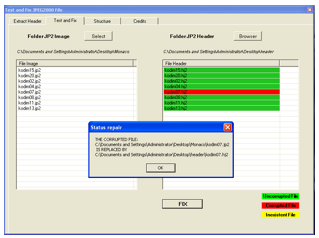 if is possible to balance the risk of concentrating crucial information in the header with tools to backup the header itself, as performed by the Fixit! utility that we discuss forward. 31. 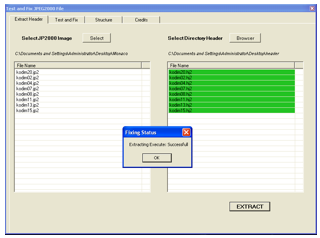 Every test can be replicated (original positions of corrupted bytes are stored in an Excel file), and all documentation is available on request. 32. 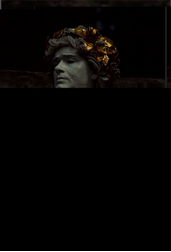 Centro di Fotoriproduzione Legatoria e Restauro, <http://www.cflr.beniculturali.it/Progetti/Jpeg2000.php>. 33. This approach was first exposed in P. Buonora, Long lasting digital charters. Storage, formats, interoperability, International Conference "Digital Diplomatics" 28 February - 3 March 2007, Munich. <http://www.geschichte.lmu.de/ghw/DigDipl07>. A more technical exposition is in F. Liberati, A Study on JPEG 2000 Error Resiliency for Long Time Preservation of Digital Images. <http://www.cflr.beniculturali.it/Progetti/DigitalPreservation>.